TOKYO (Kyodo) -- Hideki Matsui brought down the curtain on his playing career on Sunday in an elaborate ceremony at his former home park, Tokyo Dome, as he and his first pro skipper Hall of Famer Shigeo Nagashima each received the People's Honor Award from Prime Minister Shinzo Abe. 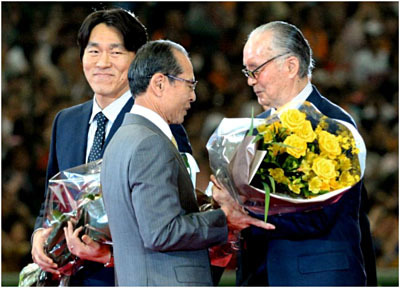 The pair was greeted by two previous honorees, Oh, who hit more home runs in Japan than Hank Aaron did in the major leagues, and Sachio Kinugasa, who played more consecutive games than long-time major league record holder Lou Gehrig. The 38-year-old Matsui, the first Japanese power hitter to make a successful transition to the major leagues, announced in December that he would call an end to his 20-year career. A career .304 hitter with 332 home runs for the Yomiuri Giants, Matsui completed his time in Japan in 2002, when he was the Central League's MVP and signed with the New York Yankees as a free agent. Matsui played seven seasons for the Yankees, and was the MVP of the 2009 World Series, before finishing out his career with a season each for the Los Angeles Angels, the Oakland Athletics and the Tampa Bay Rays, for whom he played in just 34 games in 2012. He was a career .282 hitter in the big leagues with 175 home runs. Nagashima was the manager of Japan's national team in March 2004, when he suffered a stroke and was unable to manage the team at the Athens Olympics. His brief acceptance speech was his first in public since his stroke.